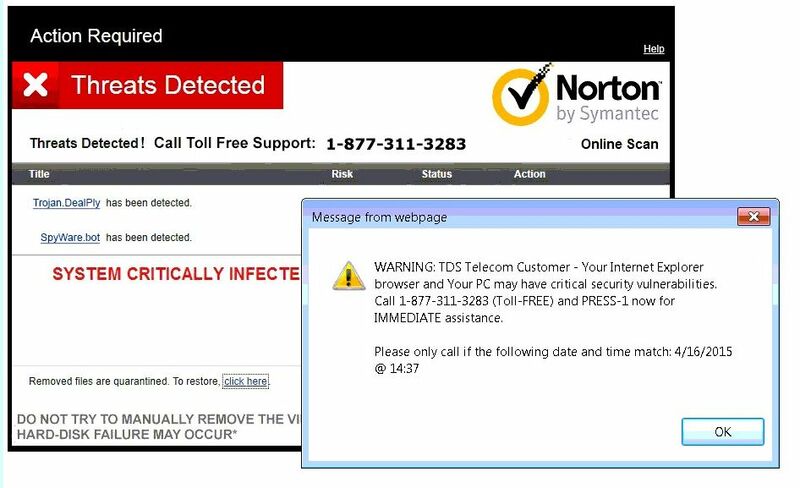 Our Remote PC Support team has been fielding lots of calls from customers asking about what is known as “scareware.” Designed to scare you into action, these real-looking popup windows “warn” you about “security vulnerabilities” and urge you to call a 1-800 number for help. The thing is, it’s a scam—these popups (see above and below) are NOT from TDS. Bad things happen if you do what the messages tell you. If you call the number, you will be routed to a fraudulent company (usually overseas) and an agent will attempt to connect to the computer to capture sensitive data such as credit card numbers and bank information. If the popup includes a link, if you click it, you’ll likely trigger a malware installation. These popups mostly generate from typing a website wrong, such as “fcaebook.com” or “gogle.com”, or clicking a corrupted link. Malware designers will even go so far as buy rights to misspelled web addresses, just so they have a way to catch unsuspecting victims. Usually these phishing attempts are generic but, on occasion, the emails or popups will resolve the customer’s IP address and embed the ISP name into the source in attempt to make it more convincing. We’ll say it again: don’t call and don’t click on any link! 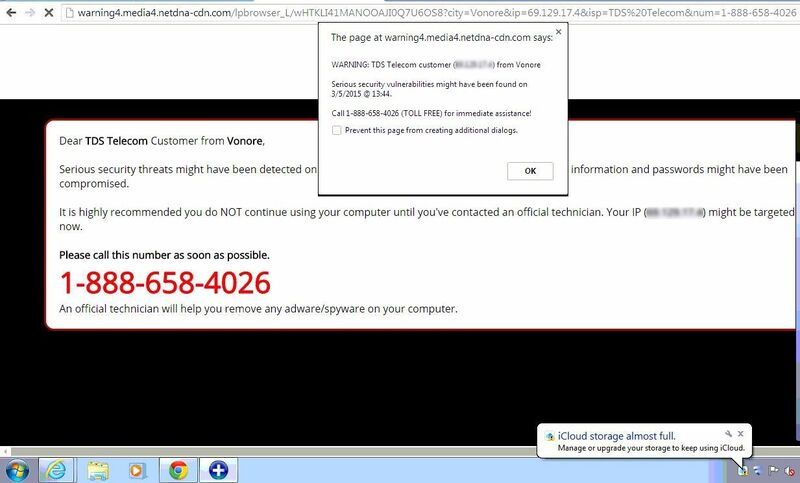 You should also know that antivirus programs do not and will not detect these popups due to the way the scammer’s code is executed in the browser. Some browser security add-ons can stop the popup but it is not 100% guaranteed. To get rid of the popup, try turning off your computer and turning it on again (a hard reboot, vs. just selecting “restart”). This will usually solve the problem…until you happen upon another scareware “trap” that’s been waiting on the Internet. If you did call or click the link, run antivirus software immediately and consider getting some help from professionals. Services such as Remote PC Support can help locate any malware on your machine and remove it. Don’t click sponsored ads on Facebook. They are not well vetted.